Thanks to Nissan, I was able to spend some time in Dallas in March. I test drove the new Nissan Murano CrossCarbriolet and enjoyed sunny Texas. 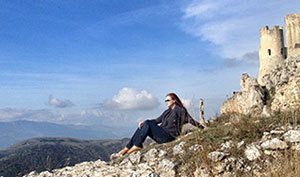 I have been in Dallas before, but with children, and while there is plenty of things to do for families in Dallas area, I liked my latest visit and think Dallas is better as a girlfriend or couple’s weekend getaway than as a family destination. The best about Dallas is that you can get the Texas experience with BBQ, cowboy boots and laid back hospitality but Dallas is so much more. Dallas is a great luxury destination for a weekend (or more!) of pampering and indulging. Dallas is really upbeat, the people have a style of their own, and it is a place where you can dress up every day of the week. Do your hair & makeup, and while you can get away with flip flops during the daytime, make sure they at least have some Swarowski crystals in them, because Dallas is all about the bling. Bring your high heels, animal prints, mini skirts and enjoy dressing up – the boho chic style is always in too, but pair your jeans with dressier clothes for the night in the city. I recommend staying in Uptown Dallas. Uptown Dallas is a glamorous neighborhood with luxury retailers, boutiques and outdoor restaurants and night clubs. 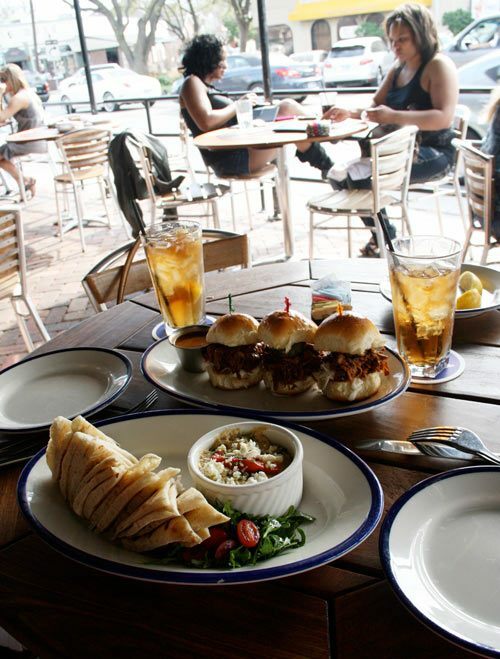 West Village and Knox Park are full of outdoor dining, posh cafes and restaurants. 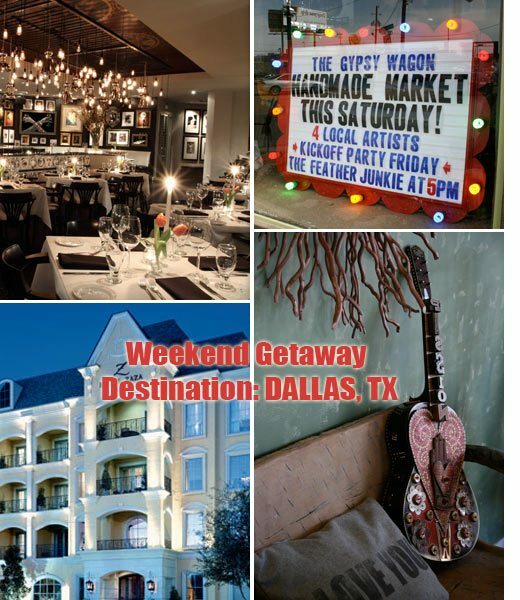 If you are looking for a fun girlfriend or couple’s weekend, here are my recommendations for Dallas. 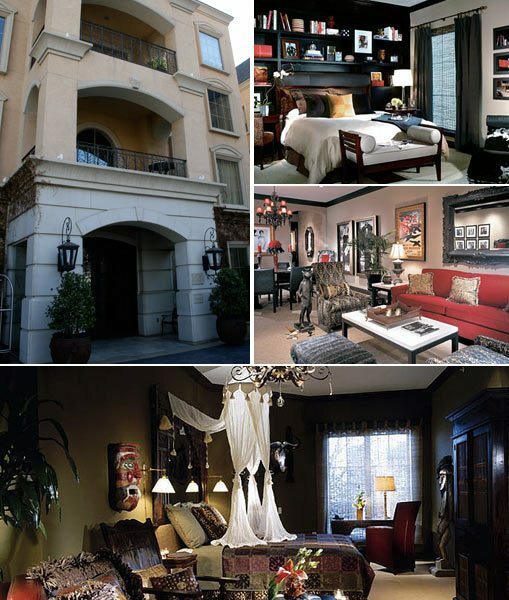 Hotel Zaza in posh Uptown Dallas is one of my favorite boutique hotels. It’s quirky but luxurious, it’s modern with traditional classic style, it’s a destination itself, and it is clear to you the moment you step into the lobby where large sculptures like tailor’s mannequins greet you. The rooms are very spacious, and you could even invite some friends in your room for a drink or two before dinner or hitting the night clubs later. They have several different type of rooms, and they are all just gorgeous – just what you would expect from an escape! The rates are $219/night and above, and worth every penny. 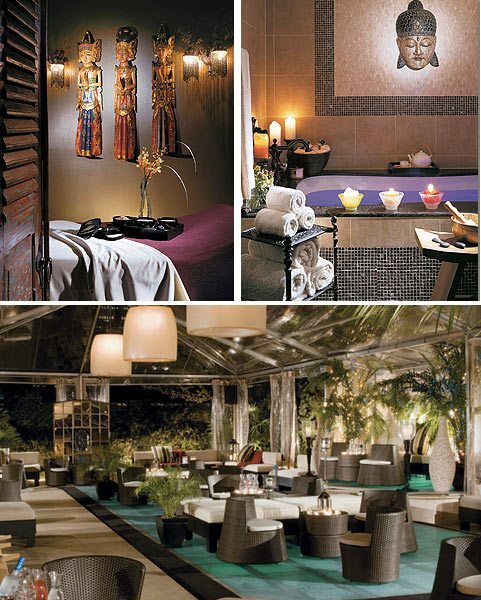 They have special packages that include Mimosa breakfast, wine amenity or a spa package etc. Yes – they have a spa in the hotel, where you can pamper yourself with a mini manicure, pedicure and 25 minute massage just for $89, or get a’la carte spa services, including a Swedish massage for two in a couple’s suite. 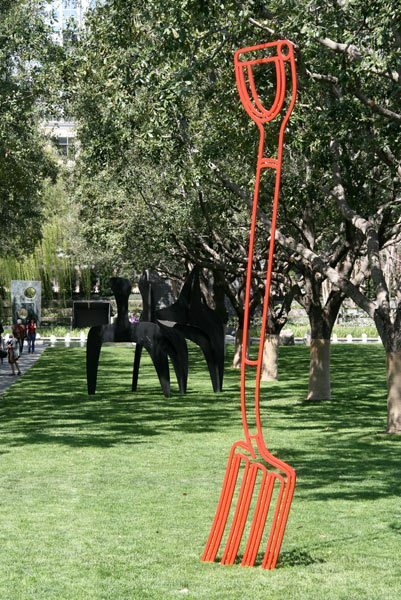 Visit the art district, and especially the Nasher Sculpture Center and Dallas Museum of Art. Nasher Sculpture Center has an interesting sculpture collection from collection of objects from ancient Latin America to modern sculpture. You’ll enjoy the cool indoors of the modern building of the Nasher Sculpture Center and the beautiful gardens surrounding it. Dallas Museum of Art is right next to the Nasher Sculpture Center and the Edward Larrabee Barnes-designed building itself is gorgeous. They have more than 23,000 works of art from around the world, from ancient to modern times in their collection, and on the top of that the Dallas Museum of Art has several exhibitions each year. Even if you won’t have time to visit the museum on a short weekend trip, drop in for the shop at DMA. Knox and North Henderson Avenue area of Dallas has become the newest place for hipsters to stroll during the weekends. 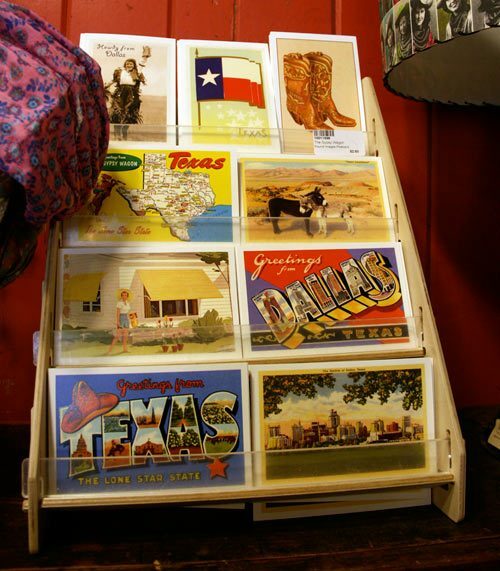 There are several antique stores, interior design stores and apparel stores in the neighborhood, and you can stop for a lunch at one of the restaurants with outdoor patio for sweet tea and Texas style BBQ in a setting for urban cowboys. We stopped to eat lunch at The Porch, and both the Chopped Brisket Sliders and the Smoked Red Pepper Hummus were delicious. My favorite stores in the North Henderson Avenue were The Wooden House and The Gypsy Wagon, conveniently right next to each others and close to The Porch restaurant. 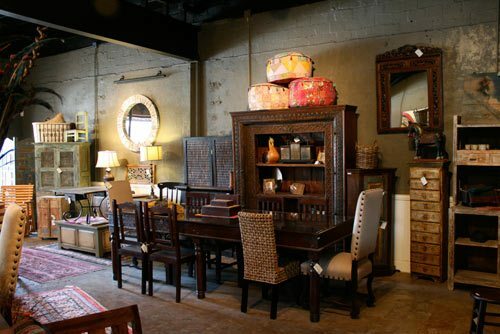 Both stores offer home furnishing and decorating products, and give you ideas for you home. 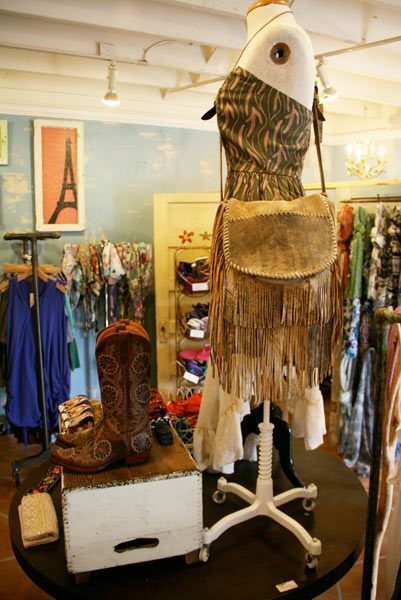 I specifically liked The Gypsy Wagon, which also sells apparel, gift items, stationery – you name it. You can read more what I thought of The Gypsy Wagon in my reviews at Skimbaco Home and Skimbaco Lifestyle. I was able to experience all of this in less than 24 hours in Dallas and felt like an entire another person after soaking in all of the influences in Dallas. These places were within a close driving range of the Dallas airports. Thanks for Nissan for paying my trip to Dallas. My opinions are my own. I’m 90 miles north of Dallas and we spend a lot of time there. If we have an overnight getaway, that’s where we go. And yet, I’ve never been to any of these places!! 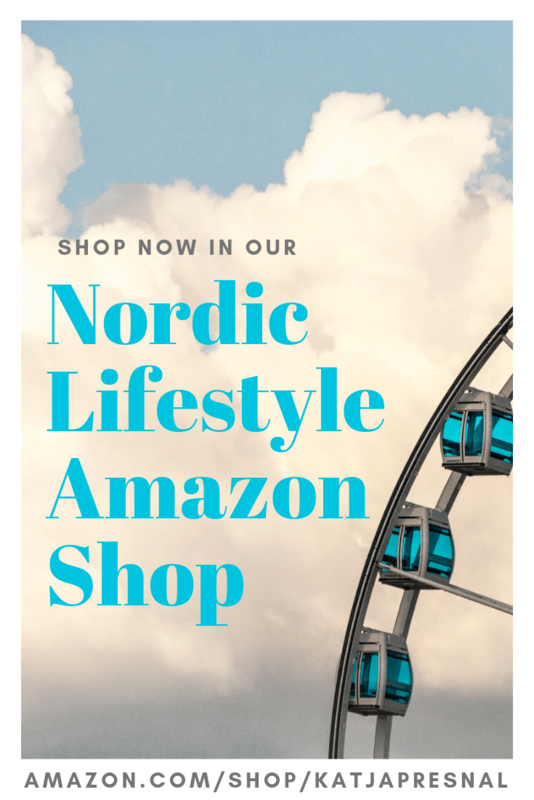 Our personal favorites include the Magnolia and Adolphus hotels, the Dallas World Zoo and Aquarium, the Dallas Arboretum, Ziziki’s Greek restaurant, Taco Diner and any Papas Brothers eatery. :-) And if you hit the east side, The Harbor District in Rockwall is a new and fun place to spend the weekend on the lake, with river walks, a light house, places to eat right on lake-side patios, live music at night, etc. We love it!